Construction of Qingdao's new airport, which is located in Jiaozhou, a city under the administration of Qingdao, is expected to be completed by the end of this year as scheduled. 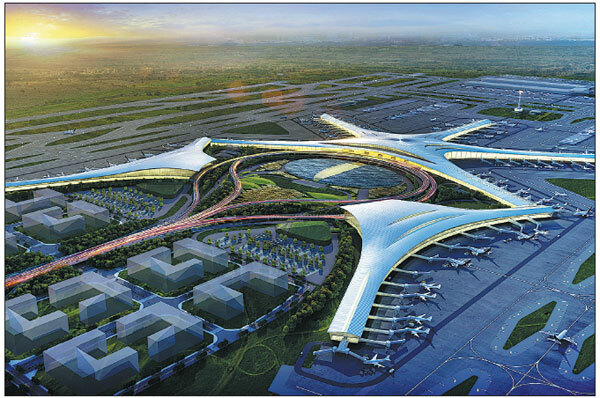 The project - Qingdao Jiaodong International Airport - broke ground in 2015. Construction of the main structures has now been completed and both decoration and the installation of equipment are underway. The starfish-shaped terminal building features the world's largest single piece of stainless steel roof. The building has been designed according to the nation's highest standards for conserving water, energy, land and other resources. Local officials said the airport aims to offer "the best experience" to passengers with intelligent technologies and cultural facilities. Two runways, which are being built according to the highest international standards designed for landing and takeoff of the largest aircraft such as the A380, will be complete by the end of the year. Also to be completed by that time are the taxiways. Another two runways, which are parallel with each other, have also been planned for the airport's second phase. When the two phases are completed, the new Qingdao airport will be able to serve about 55 million passengers a year, allowing 452,000 landings and takeoffs, making it one of the country's largest airports alongside those in Beijing, Shanghai and Guangzhou. It will be able to handle about 1 million metric tons of cargo per year by that time, according to airport officials. They said a prominent feature of the airport is its convenient connectivity to other means of transportation. It is designed as a "comprehensive transportation hub featuring seamless transfer to public transportation", officials said. The terminal building will be home to stations for a high-speed railway, subways and buses, which makes it possible for passengers to reach the city center of Qingdao within an hour and get to the other major cities on the Jiaodong Peninsula within two hours. For such great connectivity, the new airport was recognized by the National Development and Reform Commission as one of the nation's top five comprehensive passenger transportation hubs in May 2016. There will also be several car parks that are designed to accommodate nearly 3,800 vehicles, including parking areas for nearly 1,300 taxis and 190 buses. There will be plenty of charging facilities for electric vehicles, according to airport officials. In terms of roads, there will be four major highways - each with six to eight lanes - for passenger transportation. There will also be two highways for freight vehicles. The airport is about 39 kilometers from the urban center of Qingdao. There are three expressways and four railway lines in its neighborhood. Based on its first-class facilities, the authorities of the airport promise to offer first-class service through efficient management and operations. Upon completion, the airport will be one of the nation's top five comprehensive passenger transportation hubs.